A bit carried away? May be… but the thing of the crucifix is true! And actually, calling this fantastic dish a “pie” does no justice to it. I certainly can’t start writing an essay on it, but let me point out one peculiar thing: its name does not come from “Parmigiano cheese” nor from the city of Parma. Actually, its origins are so uncertain that regions like either Campania and Emilia Romagna all claim to be its homeland. Most probably instead, its origins route back to Sicily, where “parmiciana” is the dialect word for a set of wooden slats that forms a part of a shutter, and whose overlapping would recall the layered structure of the dish. Moreover, some say its name derives from the Sicilian “petrociane” aubergines, which are traditionally used for making Parmigiana. As you might have guessed, Parmigiana is not the perfect dish for people on a diet. So some people conveniently silence their conscience using grilled instead of deep-fried aubergines. The rest of the Italian population looks at them with suspicion and mistrust. Half of Italy says it should be done only with Parmigiano cheese, the other half, only with mozzarella or caciocavallo which is a very tasty cheese made in the south of the country. I must admit: Parmigiano cheese is as Sicilian as Yorkshire pudding, but I couldn’t have access to any caciocavallo! So, I tried to make an acceptable compromise in order to write this recipe and publish it before the aubergines run out of season. One last note about aubergines. Nowadays, they have completely lost their original lightly bitter taste: in generations, farmers have selected much gentle types of this plant. In the past, it would have been necessary to slice them, or dice them, and salt them in order to extract the bitter brown liquors from inside and they would have been put into a colander with a weight on top to speed up this time demanding process. You never know though: remember that any dominant genetic peculiarity can skip a generation. So you always have a little chance to end up with a slightly bitter aubergine in your supermarket bag. Put the sunflower frying oil into the frying pan with one spring of basil and one “suited garlic” clove. Set the heat on a high power(step 1 - pic. A). The oil will take about 6 or 7 minutes to come to temperature (around 190°C). Put the non-stick frying pan on a medium heat with the 10gr of extra virgin olive oil, the thyme and the “suited garlic” cloves: this is the base of the tomato sauce. Thoroughly wash the aubergines and dry them. With a paring knife, cut off the top ends. Cut the aubergines either sidewise or longwise, according to its dimensions, into 1cm or 1,5cm thick slices(step 1 - pic. B). With a paring knife, chop off the shallots’ tips and clean their routes. Cut them in half longwise and finely mince them into a brunoise*(step 1 - pic. C). Add the shallots to the hot extra virgin olive oil in the non-stick frying pan. Stir them evenly, let them gain temperature. Then, when softened, season them with a pinch of salt(step 2 - pic. A). Prepare some absorbent kitchen paper sheets on a side and, as soon as the oil comes to temperature, start deep frying the aubergines. Each slice should take about two minutes or so to cook thoroughly through: they will be ready when their meat has gain an almost translucent colour and it has browned lightly. Use tongs or a fork to turn them a couple of times(step 2 - pic. B). When ready, move the cooked slices onto the paper sheets, cover them with other sheets. Finely crush the pepper corns into the mortar then, when shallots have turned a light golden colour, add the tomato passata, stir and season with salt and the black pepper. Let it reduce for 3 or 4 minutes before moving the pan off the heat and start forming the parmigiana layers(step 2 - pic. C). Gently press the palm of your hand on the paper sheets to let them absorb the excess of oil from the aubergines(step 3 - pic. A-B). 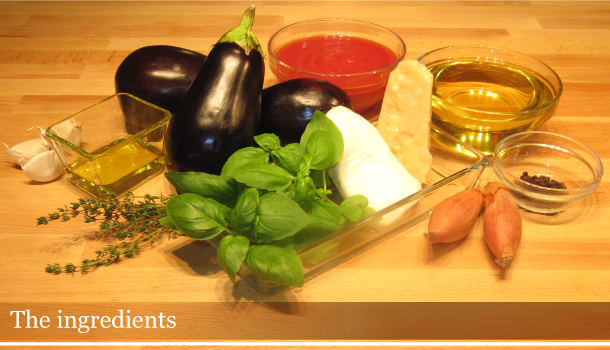 This is very important in order to avoid the frying oil to be released during the baking which would ruin the parmigiana. Move the aubergines into a plate and lightly season each side with salt. Grate the parmigiano cheese and put it in a bowl; then slice the mozzarella and gently press each slice between the palms of your hand to let the milky juice out: it wouldn’t evaporate during the baking and it would wet the parmigiana. Set aside into a small bowl(step 3 - pic. C). Spread a couple of spoons of tomato sauce on the bottom of the baking tin(step 4 - pic. A). Form a first layer with aubergines, adapting the slices to the tin’s shape(step 4 - pic. B). Brake a couple of mozzarella slices with your fingers and spread the pieces on top of the aubergines(step 4 - pic. C). Brake some basil leaves with your fingers as well and distribute them evenly on the layer(step 4 - pic. D). Cover everything with an even layer of tomato sauce(step 4 - pic. E). Sprinkle a layer of parmigiano cheese and season with ground black pepper (optional)(step 4 - pic. F). Repeat all these steps three or four times(step 4 - pic. G-I). Top off everything with one last generous layer of parmigiano cheese sprinkled with black pepper and drizzled with extra virgin olive oil(step 4 - pic. J). At this stage, you could wrap the tin with cling film and store it in your freezer for future use. Then, you would need to defrost it slowly overnight putting it in your fridge and bake it the day after. Set the oven power to 180ºC. When perfectly hot, place the parmigiana tin on the middle tray and let it cook for 20-25minutes, till cheese on top as melted completely, bubbling and slightly burning. Let it settle and chill for 5 or 10 minutes before slicing and serving.